Info "I am the destroyer. I will destroy everything!" Step On It is one of WarioWatch's microgames in WarioWare: Twisted! The player will control a giant. 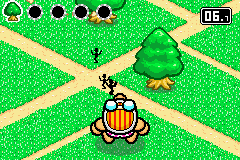 To move him, the player has to tilt the Game Boy Advance to change his walking direction. If he destroys five objects, the game is won. The player starts off the game with 8 seconds in the Spindex. 2nd level difficulty: Destroy five cars. 3rd level difficulty: Destroy five flying skeletons. This page was last edited on November 16, 2018, at 22:05.